Soldier Pills(Healing Item,1 Inventory)Restores 200 Life/Chakra/Stamina.Report and Remove from Stats After Use. Chakra Restoration Tablet (Healing Item,1 Inventory) Restores 200 chakra. Report and Remove from Stats After Use. 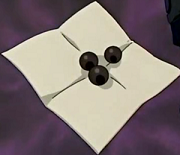 1) All users jutsu cost 20 less chakra for three turns. 2) All damage done to the user is reduced by 30 for each jutsu. 3) All users jutsu cost 25 less stamina. Muscle Enhancing Pill(Healing Item,1 Inventory)Restores 300 Stamina,Replenishes MP and CMP.Report and Remove from Stats After Use. Cigarettes(Healing Item,2 Inventory)User Loses 25 Life but gains 25 Stamina Per Turn. Each Cigarette last for 4 uses. 5 Cigarettes in a pack. Report and Remove from Stats After Use. Blood Increasing Pill(Healing Item,1 Inventory)Restores 400 Life. Ends Any Poison/Bleeding effect that is affecting the User. Report and Remove from Stats After Use. Canister of Water(Healing Item,1 Inventory) Restores 25 Life/Stamina. Canister can be used up to 1 time. Report and Remove from Stats After Use. Kawaki Cola(Healing Item,1 Inventory) Restpres 25 Life/Stamina/Chakra. +5 MP/CMP. Canister can be used up to 2 times.Report and Remove from Stats After Use. Hero's Water(Healing Item,3 Inventory)Gain 500 Life/Chakra/Stamina. After 3 Turns, Player Loses 700 Life and is Enfeebled/Impaired 250 for 3 turns. Report and Remove from Stats After Use.